ZTE Corporation is an MNC headquartered in China and is a key player in telecommunications and information technology.This Chinese smartphone manufacturer has been in India for quite a long time. However, due to some reason, it is not as popular as Xiaomi, Oppo, or LeEco. There are 2 key reason for this – its limited range of handsets and the handsets come to India after tremendous delay. The latest example is their newest phone in India, called the Axon Mini. It is priced at Rs.23,599 in India and was released in December 2015 in the US. In terms of hardware, the Axon Mini is driven by a Qualcomm MSM8939v2 Snapdragon 616 Octa-core processor which is clocked at 1.2 GHz and is supported by 3GB RAM and an Adreno 405 GPU.The handset is good enough to manage multitasking and heavy games without any lags or heating issues. At times, switching between apps and navigation through the interface may not be a very smooth experience. The phone runs Android OS, v5.1.1 (Lollipop) operating system. In the optics department, the ZTE Axon Mini comes with a 13 MP rear camera and an 8 MP front-facing shooter.The camera interface comes with useful modes like manual (provides better controls), beauty mode (clears marks on face), effect (addition of colourful filters) and smile (when the user smiles, snaps a photo automatically). Talking about design, the handset features a 5.2-inch Super Amoled display and boasts of a screen resolution of 1920x1080 pixels. The display is impressive and looks more vibrant. Watching movies on the Axon Mini will surely be an enjoyable experience. The display looks sharp while playing games and reading. As well . Axon Mini allows mobile phone users to enhance the richness of the screen using a feature called the Gorgeous Mode in display settings. This fine tunes colour reproduction makes the screen slightly brighter to view. The wide viewing angles and visibility under the bright light are good.The fingerprint scanner is seated on the rear and functions accurately.The smartphone weighs 140g and the curved back design fits easily into the hand. 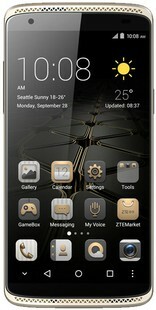 Simply put, it is a nice-looking Android phone created on solid lines. On the storage front, the phone is equipped with 32GB internal storage which is upgradeable up to 256GB via a MicroSD card. The device is juiced by a 2800mAh battery, which is not removable. On a single charge, it lasts a day at the most. In terms of overall performance, ZTE Axon Mini lags behind due to the rather inconsistent optics department. Even if ZTE had introduced this handset in India in December 2015, it would still not have been a match for brands like OnePlus One. Moreover, currently we have even more options with the likes of the Xiaomi Mi 5. The nice display and good looks can’t really compensate for the Axon Mini’s under-performance in other areas. ZTE Axon mini full specs and reviews as of Apr 2019. Buy it here!